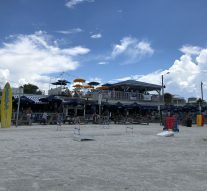 (Treasure Island, Florida) The Original Caddy’s on the Beach is located in Treasure Island, Florida; on a private beautiful white sand beach, and overlooking the Gulf of Mexico. Other than the original location, Caddy’s also has three other locations in different parts of Florida. Caddy’s offers some incredible seafood, the Gulf Coast’s best BBQ, and various types of ice cold beverages. Between the four bars located on the property, fun beach activities, and various events throughout the week, there’s always something for everyone to enjoy! When first walking into Caddy’s, the location, atmosphere, and the overall vibe of the place really makes you feel as if you were on a beach get-away vacation. 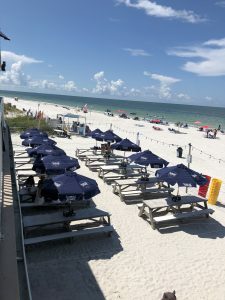 They have complimentary lounge chairs and umbrellas, an inside seating area to cool down, and also an upper and lower patio area (with misters to keep you cool) to sit outside and enjoy the Florida weather. The incredible private beach access includes places to relax with the family, as well as different games and activities for people of all ages. This includes Corn Hole, life-size ‘Connect 4’, and Tetherball. Adults have the opportunity to bring their alcoholic beverages onto the beach too! This is an awesome, local place for college students to go and hangout during days off from class. 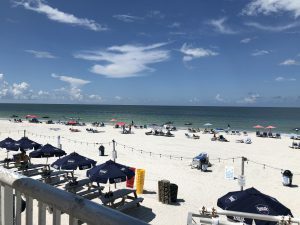 Being only 10 minutes from SPC’s St. Petersburg Campus, this is the perfect place to grab a bite or get some sun during a break between classes! The restaurant and the beach are both very well maintained and kept very clean. Caddy’s even follows the “No Straw” movement, to keep the animals happy and their environment healthy. On the patio deck, there are outside showers to rinse off after a fun time in the sun. Events open to the public include yoga 3 days a week, trivia on Wednesdays, movies every third Wednesday of the month, and live music all day every day. In addition to these fun activities, they have various events throughout the year depending on the season and different holidays. A few of their most popular dishes include Smokehouse BBQ dinner, Smoked Fish Spread, and Fish O’ the Day. They have various types of foods ranging from soups & salads, starters, big plate entrées and platters, desserts, and stuff for the kids. They even offer various drink specials for the adults, as well as a Twilight Happy-Hour, which starts at 8 p.m.
Next time you’re up for a full day of fun-in-the-sun, head over to Caddy’s. You never know what exciting surprises may be going on!